We have no idea who “Jess & Jane” are – the makers of this shirt of Rue’s – but we do know we would love them. 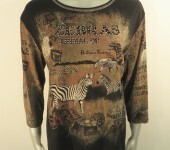 How could you not love people who do a crystal studded shirt that honors zebras? Rue’s shirt comes with a Certificate of Authenticity from Estate of Rue.